Hainan Airlines have announced they plan to launch a new non-stop service between London Heathrow Airport and Changsha Huanghua International Airport on 23rd March 2018. The new service follows the roll-out of the Manchester-Beijing service and will be Hainan Airlines' second direct flight between the United Kingdom and China. Changsha, the capital of Hunan province, is the political, economic, cultural and technological hub of the province, and one of China's famous historical cities. Yuelu Academy, Orange Island Park and Aiwan Pavilion are all must-see destinations. Unique Hunan cuisine also lets diners indulge in pleasures without stop. 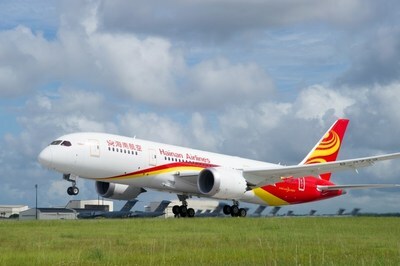 The London-Changsha route will be serviced by a Boeing 787 deluxe wide-body aircraft. Business Class passengers will be provided with 180-degree lie-flat seating, BOSE headsets and Bvlgari toiletry bags. Passengers in all classes will have access to an exclusive on-demand entertainment system and a gourmet selection of Western and Oriental meals and are allowed to use their own portable electronic devices. Hainan Airlines has been named a SKYTRAX five-star airline for seven consecutive years and was listed among the Top 10 SKYTRAX carriers. The airline also has one of the world's best safety records in that it has not had a major accident in its 25 years of operation. Going forward, Hainan Airlines will continue to provide high-quality aviation services, delivering a more convenient and safer flying experience to travellers from all over the world.